Ce blog donne un petit aperçu des ressources, moyens et productions d'un modeste amateur d'astrophotographie, robotique et impression 3D. Vous ne savez pas par où commencer ? Laissez-vous guider par les images ci-après. This blog gives a short overview of the resources, means and productions of a modest amateur of astrophotography, robotics and 3D printing. You don't know where to degin ? Be guided by the images hereafter. Here you will find items I have designed and 3D-printed. Looking for an adapter for your Star-Adventurer mount ? Take a look ! Vous trouverez ici des objets conçus et imprimés 3D par mes soins. Vous cherchez un adaptateur pour votre monture Star-Adventurer ? Jetez un coup d'oeil ! 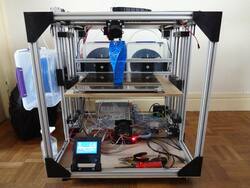 I have designed and manufactured my own 3D-printer : large (300x300x300), fast and precise (coreXY). I used my first "cheap" 3D-printer to create the main parts. J'ai conçu et fabriqué ma propre imprimante 3D de gros volume (300x300x300), rapide et précise (coreXY). Ma première imprimante bon marché m'a servi à en faire les pièces. 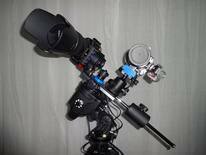 For nomadic astronomers, here is a review of the "compact" setup allowed by this mount. I used 3D-printing to improve the setup (complementary hobbies !). Pour les amateurs d'astrophotographie nomade, voici un descriptif de la configuration "compacte" permise par cette monture. L'impression 3D est passée par là pour en améliorer la mise en œuvre (hobbies complémentaires !). A base d'Arduino Mega 2560, ces robots disposent de 18 servos et d'une démarche "arachnide". Cerise sur le gâteau : ils disposent d'une télécommande bluetooth à écran tactile. j'ai tenté la débayérisation d'un EOS 350D d'occasion. Le résultat, bien qu'imparfait, est assez satisfaisant. Je souhaiterais faire réaliser un adaptateur de Pole Master sur une monture Ioptron Guider Pro. J'ai établi le plan de la pièce souhaitée. Serait il possible d'obtenir un devis et un délai? Je vous ferai part de mon avis. I can provide a bahtinov mask for 95mm filter diameter lens, for 17 € + 3 € shipping. If you order, don't forget to give me your delivery address. do you have a camera adapter for ASI071MC-PRo @ 86mm?? You can add this optional ring to your cart. When you purchase a 3-rings bracket, if you add optional rings to the same order, you will be refunded of the shipping cost of the optional rings. Do I order two rings then and you can make one of each? I do not provide Nikon / ASI adapters. The third ring that supports the camera is removable. - a 86mm diameter ring that fits the ASI071. There isn't such a "package". You can add the two items to you cart and order the two items. You will be refunded the shipping cost of the second item. En fabriquez vous pour ceux ci ? Phillipe, I am very happy with the 3d attachments already sent for the Star Adventurer. One problem I have is that when aligning Polaris it is hard to find Polaris among the other stars. I have given my wife the task of pointing the laser at Polaris while I zone in on it. Can you create a laser holder that attaches like the adapter for the Polemaster. It would be nice to screw it down to the L plate, zone in on Polaris, remove the laser, attach a second camera and then complete the alignment. I have toyed withy the idea of rubber banding it down to the SA which should get me close but I'm looking for a little more precision. Any thoughts? Hi Peter, I share your annoying difficulty in the alignment procedure to Polaris. :-( To bring Polaris into the FOV of the Polar-Finder-Scope, a small and rather cheap device is very useful: With a so called BEVEL-BOX (https://www.elv.de/bevel-box-pro-360-neigungssensor.html) you can easily adjust the altitude. Put the bevelbox simply on the battery cover and turn the Altitude-knob, until the indicated tilt angle equals the latitude of your position. Then You have to turn only the Azimut knobs to make Polaris visible in the Polar-Finder-Scope.Then fine-tuning as usual. Good luck and c.s. I am considering to purchase a Skywatcher Star Adventurer. I watched your video on YouTube and note you have a Polar Illuminator Adapter and a Seagull Right Angle Adapter. I have a Seagull 1-3.3X Right Angle Finder, would this fit your adapter? If my Seagull fit with your adapter, could you please advise how I can purchase both the Polar Illuminator Adapter and a Seagull Right Angle Adapter at the same time; also how much the postage would be (I live in Scotland). I should mention that I am using Canon camera and lenses. Your Seagull angle finder sould fit my right angle adapter, at least by using one of the eyepice adapter delivered with your angle finder. You can purchase my adapters by using the "Add to cart" Paypal button on each related page, and cheking out. If you order the two adapters, I will proceed to a combined shipping and will refund you one of the two shipping costs. I have a Seagull right angle finder and the Ioptron Sky Guider Pro. Can you fabricate a connector like you have in your video so I can connect my finder to my polar scope? Thanks. The adapter for the Seagull right angle finder fits perfectly...Thanks! In the options, you can select your type of mount. I want to buy something like Samyang 135 f:2 bracket for astrophotography but I want to attach to Star Adventure's Fine-Tuning Mounting Assembly. 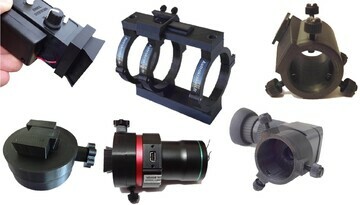 As also I want to use ASI color cooled camera & 50mm guide scope with auto guide. Is that possible to order you that ? Depending on the dovetail type you select, you can attach it to a Vixen-like clamp or a fast-release manfrotto clamp. I placed an order 2 days ago but didn't get a confirmation mail after payment. Did you receive my order? Thank you for a short confirmation. I confirm that I have received your order. As specified on my website, orders will be sent from 29/11. The 3d-printing of your orders is on its way. I will let you informed about the trackeing number as soon as it will be sent to you. Hi Philippe .... I just order the adapter for the Star Adventurer Polarscope.....however, I specified the Neewer right angle finder. This is incorrect. I need the adapter for the Canon finder. Thank you! I have taken your request into account. Did you make this bracket yourself or was it included with the camera lens? And could you make one for the Canon EF-S 55-250mm 4,0-5,6 IS II ? If so, I would like to buy this bracket and the corresponding fast release plate. I've found a cheap mounting ring for my lens and also bought the quick release plate. The single bracket is included in the telephoto lens (Tamron 80-200 f:2.8). Would you be able to print a finder bracket for a 8x50 finder that I can attach to an Intes Altes M703? It has the same system as the M603 I see pictures of on your website. And what would be the cost including shipment to the Netherlands? Please give me your e-mail address, so I can send to you some pictures of the adapter I have designed and a proposal for the printing and shipping. Bonjour. je viens tout juste de recevoir mon matériel. Merci pour la précision de la commande ainsi que la vitesse de livraison très rapide... Bien hâte d'essayer tout cela sur le terrain! je viens de recevoir ma commande. Bien emballé rapide et tout bien. Merci encore pour les petites pièces c’est parfait !! Merci pour votre commentaire et ravi que cela vous convienne. Salutations et bons ciels ! Comment faire pour s'inscrire sur votre site et commander? Et avoir un suivi? Comme nouveau acquéreur d'une star aventurer, je suis intéressé par l'adaptateur pour viseur polaire et le Polemaster mais j'hésite entre le Tandem et le dual adaptateur PoleMaster/Polar Illuminator. Lequel des deux me conseillez vous? Pouvez imprimer un masque Bahtinov pour Canon EF 400mm f 5,6 L USM et pour un Newton 200/1000 skywatcher? Il n'est pas nécessaire de s'inscrire sur mon site pour passer commande. Le paiement par Paypal se fait avec votre compte Paypal ou par carte. Pour une question de coût, j'envoie mes objets par lettre prioritaire sans suivi, comme spécifié dans ma boutique. Si vous n'avez pas nécessité d'utiliser en même temps le Polemaster et l'illuminateur polaire, le Dual adapter suffit. Concernant votre téléobjectif Canon, il doit y avoir un masque qui convient dans la gamme des masques "standards" de ma boutique qui convient à votre diamètre. Concernant le masque de Bahtinov pour votre newton 200/1000, le prix d'un masque imprimé par mes soins serait prohibitif par rapport aux masques que vous pouvez trouver sur ebay. great stuff you doing with the 3d-prints. soon i gonna order some parts for my skywatcher/star adventurer mount. 1st question reg. the 'spacer ring' (under the fast release photo dovetail): what the purpose from this ring ? 2nd question are you able to print BAHTINOV masks for the 4 below named Canon-lenses ? 1 - The spacer ring ensures a gap between the fast-release clamp and the declination axis, to avoid friction of the clamp on the declination axis body. 2 - For each dslr lens, please specify the internal diameter of the front lens on which you want to attach a Bahtinov mask. For your information, I can print Bahtinov masks up to 250 mm diameter. All of this in black finish. I see that not all items can be purchased from the site. How much for all (shipped to italy) ? I can print and send to you these parts for a total amount of 45 Euros including shipping to Italy (not-tracked international priority mail). hier j'ai fait une commande en payant avec paypal mais il n'y en a pas trace.Je n'ai pas reçu de mail même de paypal. Ai-je fait quelque chose de mal? Je ne peux pas vous dire car je ne vois aucune trace de paiement de votre part. Qu'avez-vous acheté, pour quel montant et à partir de quelle page ? Monsieur, j'essaie de vous commander un micro-focuser à 26 euros, mais quand je passe commande, la dénomination indique masque de bahtinov. Il s'agit d'une erreur sur le bouton Paypal de cet objet. J'ai corrigé l'erreur et le bon bouton vous permet de sélectionner l'objet qui vous convient. Bonjour Philippe, je vous ai commandé un adaptateur noir pour seagull le 05/ 02/ 18. Le paiement paypal s'est bien éffectué, j'ai été débité le 07/ 02. Le numéro paypal est le 0800 942 890 05/02 montant 14 €..
Si vous pouviez me confirmer la commande par mail, ce serai sympa. Je vous remercie pour votre achat. Votre adaptateur été posté hier à votre attention. Je vous en souhaite une bonne réception. Polar illuminator with sliding cover for Star-Adventurer with L-bracke I would like to but this. It is a prototype. A little bit more complex to produce, compared to the polar illuminator adapter. Some illuminators will be soon available. I will let you know. Je fais le tour du site encore une fois afin de me décider sur quoi acheter. Mais avant de passer commande j'ai quand même une question : je souhaiterais placer mon laser vert sur la griffe de mon dslr) mais du coup je vois qu'il n'existe pas de support pour cela. Une impression 3D serait t'elle envisageable ? J'ai vu dans votre vidéo que vous aviez déjà fait un support de ce type pour porter le miniscope d'Orion, celui-ci m'intéresserait éventuellement par la suite donc si tout cela est réalisable, je serais ravie de connaître vos tarifs. Pouvez-vous m'envoyer un schémas de ce à quoi vous pensez s.v.p ? Je pourrai alors étudier le design de l'adaptateur. Pardon, je me suis mal exprimée. Ce que je recherche en fait est un "collier" qui porterait le laser. Je ne sais pas si le nom est exact. Pour le petit adaptateur pour flashgrip seul, je peux vous en adresser un pour 5 € envoi compris. Hi Philippe , excellent site, very informative. I made a purchase too. Very clever designs , nice work. Your adapter for right angle viewer has been printed and sent on 19/11/2018. if you didn't receive it, I can send another one to you. In this case, please confirm me your address. Thank you for your message and your purchase. I'm just kack from a business trip and have launched the 3d-printing of your adapters. They should be sent to you not later than wednesday.